LOOKING FOR THE BEST STUMP REMOVAL IN EDMOND, OK? You found us! Let Edmond Tree safely and effectively remove all of the unsightly stumps from your property! Edmond Tree provides stump removal for properties all across the North OKC Metro area. We know that stumps and above ground roots are not appealing and can affect the natural beauty of your yard. Call us today to have our Professional Team come out and have a look! When providing Stump Removal Service, there are several options available to the client. Obviously, the main issue at hand is to remove the stump itself. When removing the stump for you, we will grind the stump down, and can either haul it away, backfill the stump hole with the grindings or make mulch for you to use about your yard. We can also backfill your stump hole with dirt and level it out so that it resembles the rest of your yard. We can also provide Root Removal Service to help you with those moisture hungry roots that just love to seek out underground plumbing systems! Our goal is always to provide “green” and natural solutions to your property, but at your request we can also apply a chemical to the roots that have been left behind from the stump removal. This will kill the roots off and protect your property from future damage. For a stump removal quote, call our Tree Care Specialists today at 405-562-5725! Do you live in or near the Oklahoma City metro area? Do you need the best tree stump removal around? Edmond Tree is the business you are seeking! Removing a stump will amplify the natural beauty of your yard and make mowing your lawn a much simpler task. Our friendly and knowledgeable tree professionals have the equipment and the know-how to satisfy your stump removal needs. Removing a stump is more akin to elective surgery or cosmetic home repair than a real necessity most of the time. However, underlying issues can exist. If you have no obvious personal reasons wanting a stump removed from your yard, consider having our professional team evaluate the stump for less noticeable issues, such as pests or pesky roots that extend further than you think. 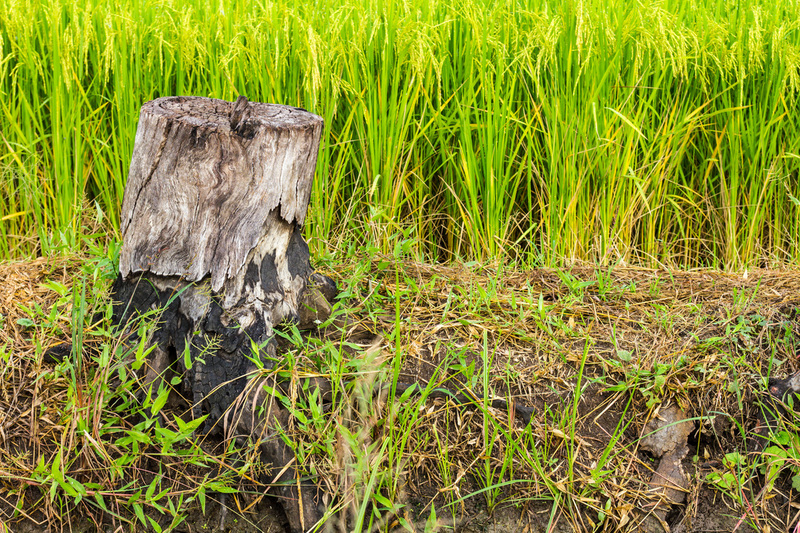 A stump can keep you from having a healthy yard since stumps tend to drain the soil of nutrients. Removing the stump will allow your lawn to thrive better. Trust the Edmond Tree staff to diagnose the condition of the stump and surrounding grounds, then bring in the proper equipment to take care of the situation. Most importantly, we will grind down the base of the tree and the primary roots. We will then haul away the mess of wood chips that are leftover. As an alternative to hauling the grindings away, we can backfill the hole where the stump had been with the grindings, or even make mulch for your yard. If you prefer that the hole is filled with soil to blend seamlessly with the rest of your yard, we can haul away the grindings and backfill the hole with soil and level it. When you are ready for your stump to be removed, be sure to clarify with the operator how deep of a hole he will grind and what you intend to do with the grindings. Leveling the stump to the ground is not adequate. Grinding down to the base of the root system is the professional standard. We can provide a root removal service so that by the end of the day you will find no evidence of the former tree, and your lawn will be hazard and nuisance-free. Our goal at Edmond Tree service seeks to provide “green” solutions to your property. However, if you prefer to treat the roots left behind after stump removal with chemicals, we will gladly accommodate you. It is best to leave stump removal to the professionals with the heavy-duty machinery. Attempting to remove a large stump yourself may potentially be a vain use of your time and energy if you don’t have the proper equipment, also creating a risk of overtaxed muscles and an incomplete stump removal. Most rentable stump grinders are too weak to handle large tree stumps. Many tree roots go deep, seeking moisture-rich soil. A small stump grinder will inevitably miss many of these underlying roots. Attempting to burn out a stump may work for the portion of a stump above ground, but what lies beneath the surface is oxygen deprived, and will therefore not burn up completely. Edmond Tree service provides quality service with excellent character and class. For a stump removal quote, call our tree specialists at 405-562-5725 today.